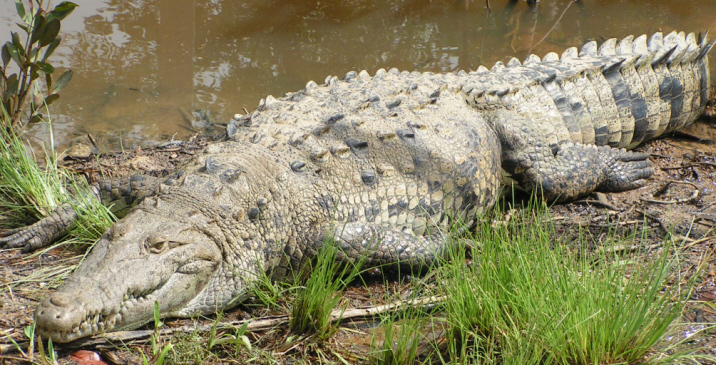 The American crocodile, belonging to the Crocodylus genus, is one of the several crocodile species found in the North, Central as well as South America. Often confused with the similar species of American alligator, the American crocodile has distinct gray-green coloration and characteristic triangular narrow snouts. Where do American crocodiles live? 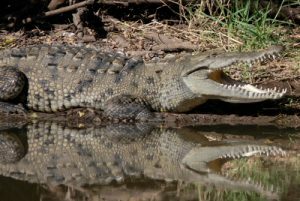 Size: The average size of the males is about 13 feet (4 meters) while the females are generally 9.8 feet (3 meters) long; but, they can grow up to 6 feet in length. The newborns grow around 8.7 (22 cm) inches long. 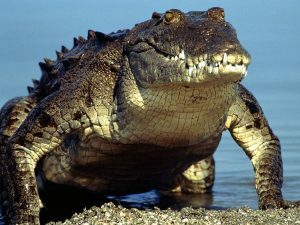 Weight: The male crocodiles are heavier than females with the average weight of the former being 840 lb (382 kilograms). The females weigh around 380 lb (173 kilograms). Color: The juveniles are deep olive brown in color with their tails and bodies marked with darker cross-bands. The adults have pale grayish-brown to greenish bodies with thick dark colored stripes only on their tails. Head: The eyes, ears and nostrils are located at the top of their heads. They have elongated nostrils with a pair of powerful jaws. Teeth: The crocodiles have characteristic sharp teeth with the fourth tooth on the lower jaw remaining visible even when their jaws are shut. Legs: They have four short, muscular and splayed legs with five clawed toes. Hide: Like most other crocodile species, their bodies are covered in characteristic scaly hide with long rows of bony scutes running down the back and tail. The distribution range of this species extends from the coasts of Atlantic and Pacific Oceans of the southern regions of Mexico to different parts of South America including Venezuela and Peru. 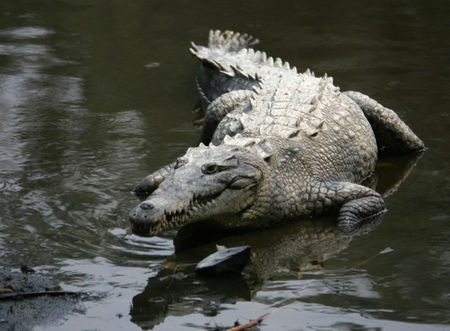 American Crocodile populations can also be found in many rivers of Jamaica, Hispaniola and Cuba. In the United States, they are only found in the southern regions of Florida. They are most commonly found in freshwater habitats such as lakes, rivers and reservoirs, while some populations are found in brackish waters such as swamps, estuaries and coastal lagoons. One American crocodile population have been found in the Dominican Republic that inhabits a hyper-saline lake. These reptiles cannot survive in extremely cold weathers. So, they build complex burrows that work as their backup shelter during cold weathers and when the water levels are too low for them to survive. The diet of this carnivorous species mainly consists of various medium and large fishes. But, it may prey on anything from large mammals and reptiles to birds, crabs and turtles. It occasionally feeds on carrion as well. The juvenile generally feed on frogs, snails and various insects. The males are solitary and territorial in nature. They spend the daytime basking in the sunlight in their watery habitat. The crocodiles hunt early at night, especially during moonless nights. However, they feed anytime they want to. American crocodiles are ambush predators, meaning they wait for the prey to come near them and then hunt them down instead of chasing the animals around. They remain in self-dug burrows to escape the extreme heat during the summer months. The animals of this species generally move by crawling on their bellies. But they are also able to “high-walk”. They are able to cover long distances on terrestrial lands when looking for new habitats. The adults do not have any predators as they are at the top of the food chain in their ecosystem. 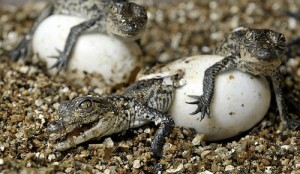 The baby American crocodiles are vulnerable to animals like leopards, skunks and large reptiles. Animals including foxes, raccoons and skunks are known to feed on their eggs. The nictitating membranes and lachrymal glands (tear glands) protect the eyes when the crocodiles remain in water for long periods of time. Their eyes, ears and snouts are situated on top of their heads to allow them keep the rest of their bodies submerged in water while hunting. They are powerful swimmers, being able to swim at a speed of 32 km per hour (20 miles/hour). Their respiratory system allows them to remain under water for long periods of time. The digestive system of this species is most acidic among all animals. It can easily digest horns, shells and bones of other animals. Their jaw-strength enables them to break the bones and horns of their prey. The breeding season for this species continues form late fall to early winter. The male American crocodiles make loud growling sounds to attract females during the mating season. Their reproductive capabilities depend on their size. The females become sexually matured when they become at least 9.2 ft (2.8 meters) long. They start building their nests using mud, sand, and dead vegetation between February and March. The nests are located alongside water bodies with adequate vegetation growth nearby. The gestation period lasts from 3 to 4 weeks. The females dig diagonal wide holes into the sides of their nests to lay 30 to 70 eggs, each being 8cm long and 5cm wide. The white elongated eggs have characteristic pores all over their brittle shells. Both the males and the females take care of the eggs during the incubation period. The eggs take 75 to 80 days to hatch. The gender of the hatchlings depend on the surrounding temperature as eggs hatched in temperatures around 90°F produce male crocodiles while those hatched below 85°F produce female offsprings. The newborns make soft croaking sounds when coming out of the eggs. Their mother hears the sound and come to scoop them out of the shells and carry them to the nearest water source. The young crocodiles start hunting once they become 9.4 inches to 11 inches long. American crocodile hatchlings are taken care of by their mother until they set out to establish their individual territories. Their average life span ranges between 50 years and 70 years. This species is listed in the “Vulnerable” category by the IUCN. They are protected by law in most of their habitat range, with hunting for the hide, habitat loss and global warming being the principal factors threatening their existence. It is a keystone species, which means the density of their populations affects their natural environment. They have the widest home range among the four extant crocodile species found in America. A large member of the species can gallop at a speed of 16 km per hour (10 miles/hour). They are considered less aggressive than the other crocodiles and alligators found in their distribution range as there are fewer recorded fatal attacks on humans involving the American crocodiles. These reptiles are able to survive in saltwater habitats, even in seas. 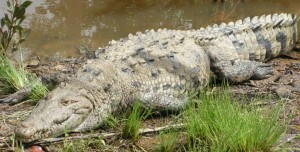 The largest specimen of this species was a 5.5 meters (18 feet) long male, found in the Tarcoles River in Costa Rica. Unlike the Old World crocodiles, who rely on birds for cleaning parasites form their bodies, the American crocodiles depend mainly on small fishes for this purpose.